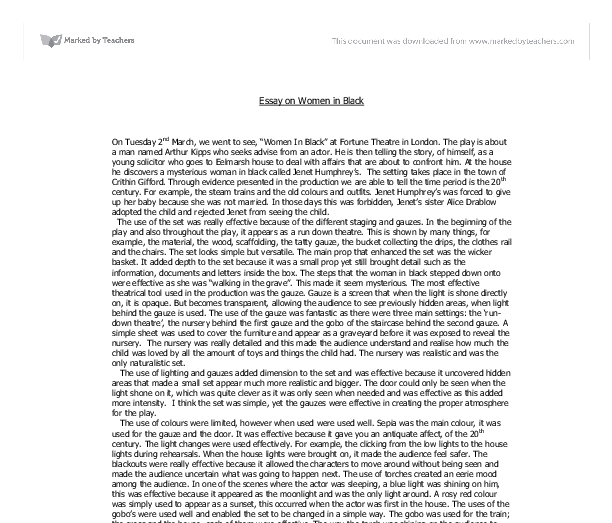 Essay on Women in Black On Tuesday 2nd March, we went to see, "Women In Black" at Fortune Theatre in London. The play is about a man named Arthur Kipps who seeks advise from an actor. He is then telling the story, of himself, as a young solicitor who goes to Eelmarsh house to deal with affairs that are about to confront him. At the house he discovers a mysterious woman in black called Jenet Humphrey's. The setting takes place in the town of Crithin Gifford. Through evidence presented in the production we are able to tell the time period is the 20th century. For example, the steam trains and the old colours and outfits. Jenet Humphrey's was forced to give up her baby because she was not married. In those days this was forbidden, Jenet's sister Alice Drablow adopted the child and rejected Jenet from seeing the child. The use of the set was really effective because of the different staging and gauzes. In the beginning of the play and also throughout the play, it appears as a run down theatre. This is shown by many things, for example, the material, the wood, scaffolding, the tatty gauze, the bucket collecting the drips, the clothes rail and the chairs. The set looks simple but versatile. The main prop that enhanced the set was the wicker basket. It added depth to the set because it was a small prop yet still brought detail such as the information, documents and letters inside the box. ...read more. Also, throughout the play, the pony and trap noise was heard and this usually occurred before something frightening happened. This was effective because it created tension by building the audience's fears up. The noise was occasionally used to trick the audience in to believing something scary was about to take place. The train announcements were really effective because it made the audience feel as if they were at the train station too. This was created using surround sound. The way the actor changed seats to represent him changing trains was really efficient as it was so simple yet interesting and he didn't need to do much to get his point across. Also in the scene at the pub, the sound affects were really effective because it was a typical busy, crowded area and you could imagine it happening. One of the most memorable sound affects for me personally was in the church as you could hear the voice coming from the priest and it was in a big empty church. This gave a feeling of a cold and scary atmosphere. I thought this joined with the dimmed lights was really effective. Another memorable scene was the rocking of the chair and this was effective as the noise was coming from above, in the attic. This gave a feeling of mystery and created tension as the audience were left in suspense just waiting to be scared. ...read more. Arthur Kipps also played Sam Daley who was the owner of spider the dog. The use of communication between him and the dog was interesting and affective because although there wasn't a real dog, the actor and Arthur made the audience really believe there was. He also played Gerome, who was the man he went to the funeral with. When Arthur played Keckwick, he wore a duffel coat, a big scarf and gloves. When he played Sam Daley he wore cashmere Hammel coat, as he was a smart businessman. The women in black's outfit was set in the 1840's, she wore a long black cape and wore a bonnet. The only real flesh you could see was her pale luminous face. If her face was lit, then you could only see her face because the light was shone on her and you couldn't see her cloak. The different use of coats identified the different characters on stage, and it helped the audience realise the changed characters. Overall, I really enjoyed Women In Black; I thought it was a well-performed play. The tension was being created throughout the play and managed to scare the audience. I found the play enjoyable, the way the tension was built and how everything was unexpected and unpredictable. I found it fascinating how the play was so well performed and by only two main characters. I really liked how Arthur Kipps was telling the story and how strong he was for a delicate man at his age. I hope to see Women In Black again in the future as I thought it was brilliant. ...read more. 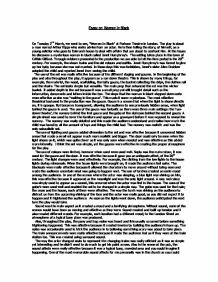 As the play developed, so did the special effects, causing the tension and suspense to grow along side. The Actor introduced new sound effects (these were very primitive to begin with, for example, a bird singing and people laughing). The ever present humour between The Actor and Mr. So how do the director and actors create such a tense and thrilling atmosphere? The techniques are in some ways very complicated, but on the most part, were very simple. The most predominant technique was in the use of sound. Spielberg uses this point to release all of the excitement and tension that has been building up, transferring the audience into a relative calm. In the whole of the Battle scene, death is an element not escaped from. Spielberg has chosen to portray War how it really was, holding nothing back. to rehearse with the mic only after the C-stands and flags are adjusted. With production attitudes like that, is it any wonder that the resulting production sound is less than breathtaking? Perhaps a more apt phrase might be "hardly usable"! and the upper class when they don't deserve it, they are like helpless victims of his uncontrollable anger. "Here it is. I quote: Pusillanimous, adjective. Wanting of firmness of mind, of small courage, having a little mind, mean spirited, cowardly, timid of mind. The production I am choosing to write about is called 'woman in black'. know this and he does not get to meet her but he finds the child's nursery all neat and tidy one minute and when he returns back to the nursery shortly after it is all messed up as the woman in black had been in there after him.